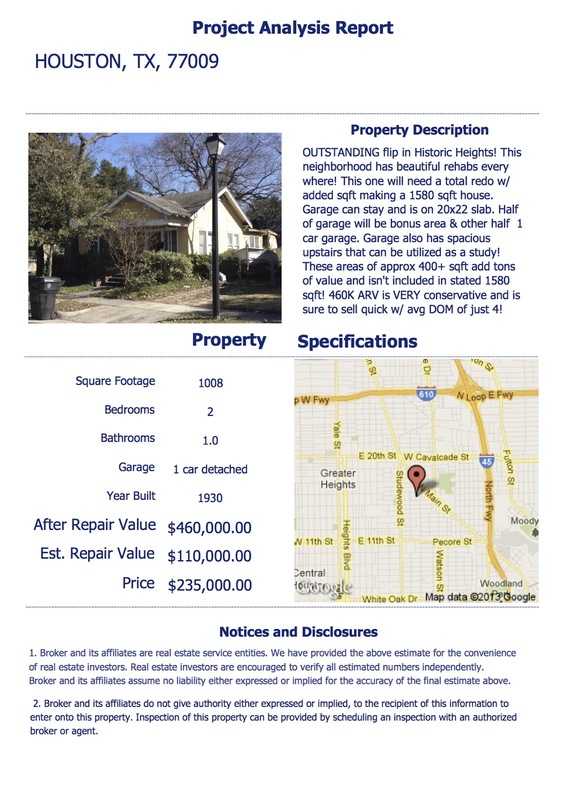 American Wholesale Property: Excellent Flip in the Heights!! Excellent Flip in the Heights!! OUTSTANDING flip in Historic Heights! This neighborhood has beautiful rehabs every where! This one will need a total redo w/ added sqft making a 1580 sqft house. Garage can stay and is on 20x22 slab. Half of garage will be bonus area & other half 1 car garage. Garage also has spacious upstairs that can be utilized as a study! These areas of approx 400+ sqft add tons of value and isn't included in stated 1580 sqft! 460K ARV is VERY conservative and is sure to sell quick w/ avg DOM of just 4!